Design Hovie Studios has designed the new presentation folder and brochure for MOKU Builders. MOKU is a "green" builder specializing in upscale residences on Maui, Hawaii. Design Hovie Studios selected a rich, textured espresso brown paper for the folder and off set it with a sharp, metallic silver MOKU logo. 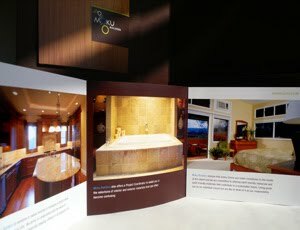 The brochure is a compact 4.75"x4.75" tri fold piece that showcases the various residences MOKU has built. The entire project was completed in one month, designed by Creative Director Hovie Hawk.